Add another comic adaptation of a classic film series from Full Moon Entertainment to the Action Lab: Danger Zone repertoire. 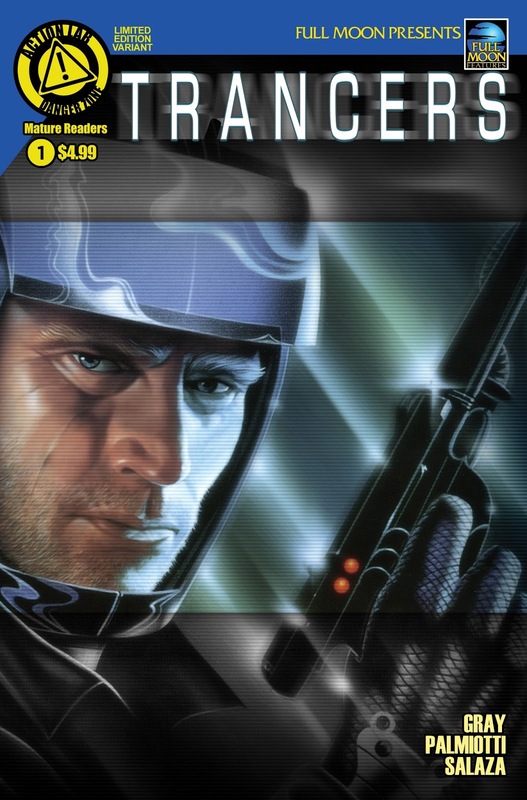 Trancers by Justin Gray and Jimmy Palmiotti is the latest feather in the publisher's cap. Trancers is the story of decorated Police Trooper Jack Deth. A cop from the far flung future of the year 2247, Jack must travel back to 1985 Los Angles on a one-way mission to capture a fugitive with the power to transform ordinary people into psychotic killing machines. With Trancers, Gray and Palmiotti break ground on the Full Moon Presents line of comics, featuring an all-star creator line-up including Tim Seeley, Brockton McKinney, Dan Mendoza and Puppet Master-mind Shawn Gabborin. The first issue will feature a variant cover by Amanda Conner. Full Moon Presents: Trancers #1 is scheduled for an October 2015 release.